With a price tag approaching $2 billion, this future New York City landmark is one of the largest commercial building projects currently under construction. It's also one of the most ambitious. Comprised of two towers and a joining base, both Otis and ThyssenKrupp were hired to install the elevator systems for six very different types of tenants. 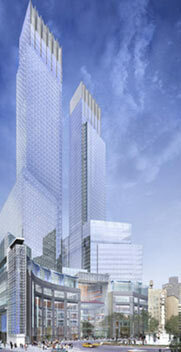 Otis contracted us to supply 16 custom cabs and 246 entrances for the two towers. AOL Time Warner Center will feature two 55-story towers that will soar 750 feet over the southwest corner of Central Park. These twin towers will be joined together by a semi-circular base, which curves elegantly around a portion of bustling Columbus Circle. The large base of the complex occupies an entire city block. Despite this immense size, the architect still had to carefully plan the layout of the base section to ensure that each of the building's tenants would have easy access to their space. Complicating this task was the fact that each of the building's tenant types would require their own separate elevator sets. A high-end retail center and several exclusive restaurants will occupy the majority of the base, with levels both above and below the street. From a street level production studio that is open to an exterior plaza, CNN will broadcast a new morning show that interacts with crowds that gather outside. CNN, a 250 room Mandarin hotel, a major retail complex, 203 high-end condos, and the new Jazz at Lincoln Center concert hall will all share space with the anchor tenant, AOL Time Warner.